These pretty cakes are perfect for any children’s party, celebration or afternoon tea for friends and family. Easily decorated with Dr Oetker icing and pretty wafer daisies. 1. Preheat the oven to 190°C, gas mark 5. Line a 12-hole cake tin with 12 paper cases. 2. Whisk the Flora Buttery with the sugar until pale and fluffy. Whisk in the eggs, one at a time until combined. Fold in the flour and spoon into the paper cases. 3. Bake for 15-18 minutes until golden and a skewer comes out clean. Allow to cool on a rack. 4. Using a star nozzle, follow the instructions on the icing can to decorate the cakes, making 6 pink and 6 vanilla. Top each with a wafer daisy. Flora Buttery creams with the flour quite easily so makes for quick sponge prep. 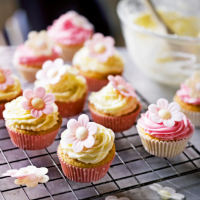 Add any essence you like to the butter before creaming to make different flavoured fairy cakes.